Today, we get to know soprano Mary Elizabeth Williams--and her character, Serena--a little better. 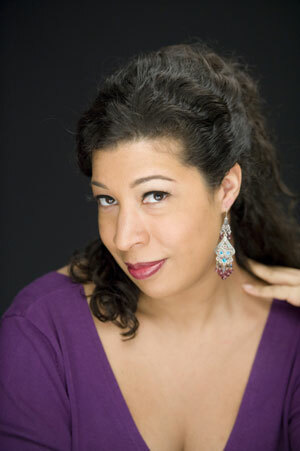 Williams was a Seattle Opera Young Artist in 2000 (Elvira in Don Giovanni), and made her mainstage debut as Leonora in Il trovatore back in 2010. Now she's back for Porgy and Bess, and in our Q&A, she tells us what's likeable about Serena, what it's like to portray grief on stage, and shares some of her favorite Porgy and Bess renditions. How did you get started singing Serena? My first experience singing Serena was thanks to Dennis Hanthorn at the Atlanta Opera. He knew me back when I was a young singer in Milwaukee (at the time, he was the General Director of the Florentine Opera there), and had hired me for a small role in Der Rosenkavalier while I was in school. He called me out of the blue in 2004 while I was living in France, finishing up the young artist program at the Opera National de Paris, and offered me the role for the following season. It was my first good-sized role at a professional level in the USA, and I will forever be grateful that Mr. Hanthorn remembered me—and hired me! Tell us about Serena—her pride, her intolerance, her faith. Perhaps it is a weakness of mine that I cannot sing a character well unless I like her—and in my early experiences, observing Serena from the audience, I can't say that I had much affection for her. She always seemed so haughty and mean-spirited. And inflexible! She was a piece of work. Because I didn't like Serena much, it was difficult for me to empathize with her. So, when it came time for me to try my hand at bringing Serena to life, I remembered my own experiences as an audience member and promised myself I would try my best to blaze a newer, sweeter trail as Serena. I have worked hard to humanize her, mostly for my own sake! I try to show that Serena is a woman who believes deeply in the comfort and grace of God, and who looks to religion to give meaning and a framework to her life. She has lived through some very bad times and is distrustful of anyone she doesn't know well. She likes to keep her world small because she is an exacting woman, and chaos and change make her anxious. She is fiercely protective of her family, and holds them to a very high standard of behavior—but under her tough exterior is someone who loves just as fiercely. I try to find moments, being Serena, to show the audience her softer side...I want the audience to see her hold her children close, smile fondly at her husband, and help her neighbors. Otherwise, Serena is often remembered only for her wailing and spiteful words—and to me, she's so much more than that. 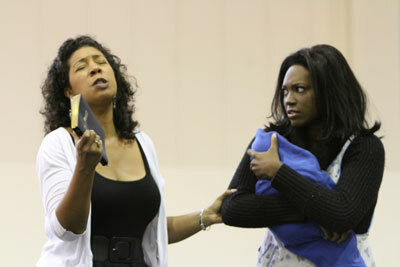 Mary Elizabeth Williams (Serena) and Angel Blue (Clara) rehearse for Seattle Opera's production of Porgy and Bess. In the prayer “Oh Doctor Jesus,” you’re able to improvise your own cadenza(s). Do you usually do the same thing, or do you try to mix it up each time? In general, I am the type of singer that always mixes things up, even when I'm singing Aida or Trovatore! I find that when I let the spirit of the moment and the music move me, interesting things usually happen. In general, though, the "mixing" I do is pretty tame—I might play around with word stress, dynamics, or perhaps where I choose to breathe in a phrase. I guess I have learned over time that these are the things I can change from performance to performance without driving the conductor crazy. I am not the type of singer to interpolate cadenzi; truthfully, that's never been my strong suit, and I prefer to leave the melody-making to Gershwin, who was much more talented than I! The grief you channel in “My Man’s Gone Now” is hugely powerful. Is it difficult to get yourself to that emotional place, or does it come naturally? Do you have to be careful so that your own emotions don’t get in the way of your singing? It is very nice to know that the audience feels something powerful when I sing this aria. I have always felt, in every work I sing, that communicating emotion is my primary job as a performer. I will be completely honest that, most of the time, I actually cry real tears when I sing "My Man's Gone Now," because the music carries me to place of legitimate grief. I have always been able to sing and cry at the same time, thank heaven; with all the sad roles I sing, I end up crying onstage quite a bit! I have never lost a spouse, but I have many emotional memories from my life that I draw on to sing the role of Serena: for example, the waves of physical pain that would come over me in the months following my father's death. I remember the extreme juxtaposition of emotion; I could laugh at a happy memory of him and 30 seconds later be dissolved in tears. I remember being angry he was gone. I remember feeling a rush of gratefulness that he had lived such a good life. I try to use these experiences as an emotional blueprint, because I think grief is a universal and animal experience to which we all can relate. 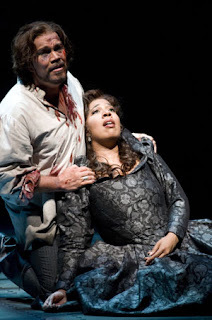 Arnold Rawls (Manrico) and Mary Elizabeth Williams (Leonora) in Seattle Opera's 2010 production of Il trovatore. Nearly everyone is familiar with the music of Porgy and Bess, thanks to countless renditions over the years. Do you have a favorite performance of a song from Porgy and Bess by a non-opera performer? Oh my, this is a tough one! I love Nina Simone's "Summertime," and everything Ella Fitzgerald ever sang from Porgy and Bess, because I love everything she does, period. I have a sassy little rendition of "It Ain't Necessarily So" featuring Beverly Kenney singing with only a solo drum accompanying her. I love that version. Louis Armstrong’s rendition of "A Woman is a Sometime Thing" is a masterpiece, too. Gershwin wrote an opera that can't help but be re-imagined, repurposed, and quoted—and I think Gershwin would be very happy that we're still finding new ways to bring this music to life. Thanks for an interesting and revealing interview withMs. Williams, especially the part about crying real tears and singing at the same time. Her stressing the importance of conveying emotions in singing is something we in Saettle can also experience when Ausrine Stundyte sings Cio-Cio-San in May, for that is Ms. Stundyte's emphasis and competence. I look forward to Ms. Williams Serena, and I'm happy I can now experience Ms. Williams and Ms. Daltirus in the same performance, rather than in different casts as with Leonore in SeaOp's "Il trovatore" in 2010, where I admired both artists greatly!! I also remember Ms. Williams superb contribution to the Memorial for Perry Lorenzo held in McCaw Hall. If you don't already have tickets for "Porgy & B", get them, as it will be an excellent performance, I'm sure!! !